This bright and modern equipped 50 m2 (530 square feet) apartment is situated on the second floor in a 19th century building and looks onto a quiet courtyard. Due to its central location in the 7th Viennese district it offers a wide range of openings for tourists, most of the tourist attractions can be reached very easily bypublic transport. The entire apartment has been recently completely renovated. 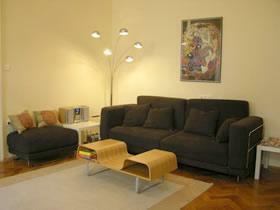 It is comfortably furnished and has room for up to four persons.